So, fish. Let’s talk about their current situation. Wild fish good; genetically modified fish not so good. Pretty simple. Lately I have been receiving a smattering of emails, requests to sign petitions, and Facebook group membership suggestions all relating to the Wild Pacific Salmon, now being considered as BC’s symbol of strength, resilience, and culture. Seems reasonable as Pacific Salmon can be found on almost any menu, in any museum of BC history or culture, and was once found in every river. It also seems reasonable, because the wild population of these beautiful creatures are in a bit of a pickle and in need of some more serious recognition and protection. With the introduction of farmed salmon, and now transgenic species of the fish escaping from the confines of lice-infested, waste-riddled, open-net cage farms, the wild stock is in serious danger. More so than ever before. 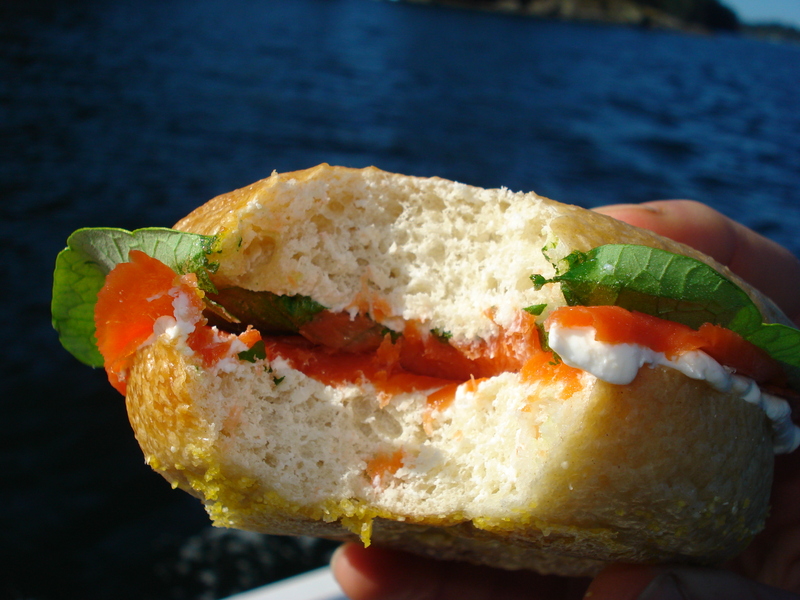 A friend of mine who has been in BC for most of his life, closely connected to the population of all things edible, has written to me that there are hardly any fish this year, noting also that he has been involved in the fight to save the species for decades. Yes, global warming, over-fishing, and contamination of our waterways all contribute to the threat, but in the past several years, genetic engineering is rearing its even uglier head, beyond the scope of the endless fields of corn, wheat, soy and cotton, brings this problem to a whole other level. 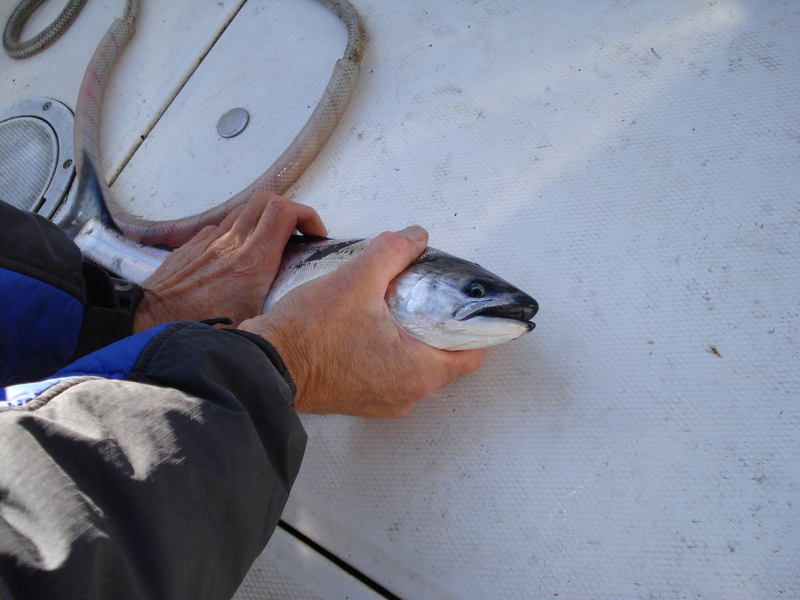 It is generally franken-salmon, a relative to Atlantic Salmon, being raised on the Pacific Coast in net-pens along the coast of BC. But as Les Blumenthal writes for the Washington Post, “by some estimates, 400,000 to 1 million Atlantic salmon have escaped into the wild from the 75 or so net-pen operations in British Columbia. A Purdue University study using a computer model — and widely criticized by the biotechnology industry — showed that if 60 transgenic fish bred in a population of 60,000 wild fish, the wild fish would be extinct in 40 generations.” I don’t know how you might feel about this, but from what I understand, anything that becomes extinct leaves a trail of consequences that is impossible to predict. Predators and prey both challenged by the void. This introduction of a genetically manipulated acquroversy has lead me to ponder the situation closer to home. I have been trying to figure out whether there is any difference between what’s happening in the rivers and ocean of the west coast, and our very own Great Lakes. I am a huge fan of Splake. It’s a cross between a lake trout and a brook trout, which I have written about ad nauseum. I love its flaky, orange flesh, it’s tiny little scales and clear bright eyes. I love the way it holds up on a grill and cooks evenly from the outside inwards on a hot pan. I adore the delicate flavour and not-too-overly-fatty mouth feel that seems to melt on the tongue, requiring little in the way of chewing or teeth. But what, prey tell, is the difference between that of our local fish scientists introducing such a mule to our waters to repopulate the lakes and the genetic engineering of salmon in BC? This intervention seems less than favourable when dissected and deboned. Perhaps the trout is in cahoots with the zebra mussel mafia and is quietly planning yet another unwelcome and prolific invasion. Perhaps the few native fish we have left in the lakes will be bullied and picked on by the new kids, who generally grow faster than their predecessors, and will give up the fight, only to be devastated by the conquerors. There doesn’t seem to be much in the way of research on the subject, and I shy away from quoting Wikipedia most of the time, so I will leave the question open. But to me, the use of the terms “man-created hybrid” when associated with a species of any organism, is a red flag (http://members.shaw.ca/amuir/splake.html). Does anyone out there have any idea if my fear is valid? There are ways for us to fight upstream with the government and protest bogus policy and sustainability-washing certifications, that eco-organizations are doling out like candy so that companies can sell more product to unsuspecting salmon eaters. Alexandra Morton, who has done extensive research on salmon stocks, private and public policies has sent out the letter following this post. If you feel particularly strongly about the remarkable power that massive acquaculture companies have over our environment, our governance, and our food system, please take the time to read and react to Alexandra’s call for help.